Do you celebrate Pi Day with your students? I think taking a break from routine and celebrating this special number is a great way for kids to have fun and and celebrate math all at the same time. If you’re looking for something new to try, check out the activities below! The first two come from my store All Things Algebra, and the remaining activities come from some of my friends. 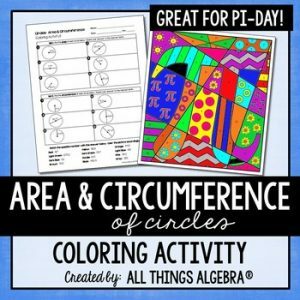 Area and Circumference Pi Day Coloring Activity: In this activity, students will practice finding the area and circumference of circles given either the diameter or radius. They color this super cute pop art pi symbol, which makes for a great display in your classroom! 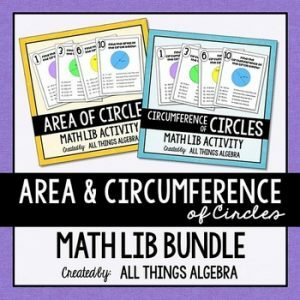 Area and Circumference of Circles Math Lib Bundle: This is a bundle of two products from my store. In each activity, students rotate through 10 stations and practice finding the area or circumference of the circle using the given diameter or radius. The answer they get at each station will create a silly story about a teacher in their building. 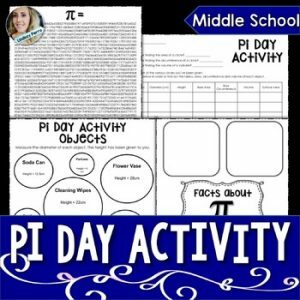 The story is editable, so you can change the names of the teachers and other elements to make it customized for your students, and even make it all about pi day! If you don’t have time for students to complete these activities separately, you can combine them by using 5 stations from the area activity and 5 stations from the circumference activity. 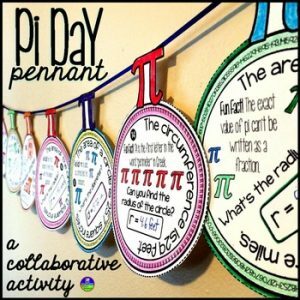 Pi Day Pennants: This activity comes from my friend Shana from Scaffolded Math and Science. Students celebrate Pi Day while working with the circle formulas to find area, circumference, radius and diameter. Each pennant also includes a Fun Fact that students can read as they complete their circle problems. Once a pennant is complete, it can be hung along a string in your classroom to celebrate Pi Day! Pi Day Collaboration Poster: This activity comes from my friend Jenny from Art with Jenny K. Jenny designed the pi-symbol for my coloring activity above. She is crazy talented! 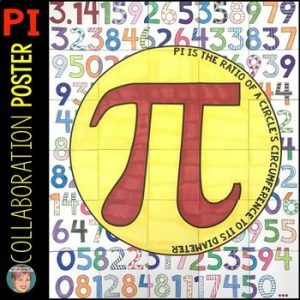 This fun, collaborative activity allows your students to each participate in creating a classroom poster for Pi Day (or any time of the year). When printed at full size the final poster is approximately 28 inches by 42 inches. There are 30 pieces and each piece fits on a regular 8.5 inch by 11 inch piece of paper. Pi Day Circle and Cylinder Project: This activity comes from my friend Clint from Clark Creative Math. This project includes three parts: (1) “Discovering Pi”: Students practice measuring, diameters, radius and circumference on five round objects. (2) “A Slice of Pi”: Students use drawings of pies and slices and their knowledge of pi to calculate the volume of the slice and estimate the volume of the entire whole pie. (3) “Pi Day”: Students sketch and measure a slice of real pie to calculate its volume and estimate the volume of the entire pie. 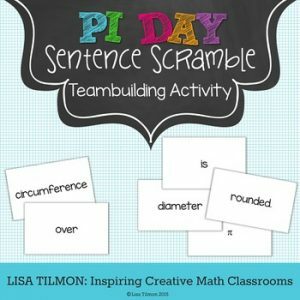 Pi Day Sentence Scramble Team Building Activity: This fun team-building activity comes from my friend Lisa Tilmon. Working in groups of 3-4 students, each group will each receive an envelope with 8 words. Teammates must work together to exchange words and unscramble four 8-word sentences all about Pi Day. What makes this an extra challenge is that they can not talk while they complete the activity. 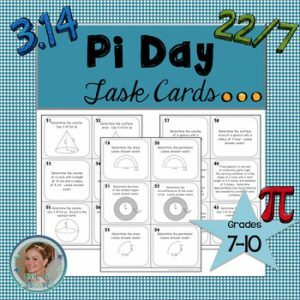 Pi Day Task Cards: This activity comes from my friend Amanda from Free to Discover. These task cards facilitate practice with 2D and 3D measurement. Two-dimensional tasks: find area and circumference given radius or diameter; find radius, diameter, circumference, or area given circumference or area; solve word problems; determine area and perimeter of irregular shapes; solve literal equations. Three dimensional tasks: find volume and surface area of cylinders, cones, and spheres; solve real world applications; solve literal equations; solve problems involving Pythagorean Theorem and cones; determine volume and surface area of composite figure; compare volumes after doubling or tripling radius; select dimensions that meet requirements for volume or surface area; explain how formulas are related. 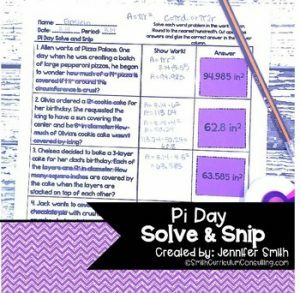 Pi Day (Area and Circumference) Solve and Snip: This activity comes from my friend Jennifer from Smith Curriculum and Consulting. Students will read a word problem and then solve the problem by showing work in the show work area. Then once they have solved their problem, they will find the correct answer in the solutions bank and glue it in the answer column for the correct problem. 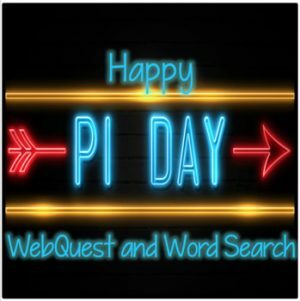 Pi Day Webquest and Word Search: This activity comes from my friend Jennifer from Teaching High School Math. Students will complete a 20 question web quest that they can use to learn some things about the number pi – including a little bit of history and some fun facts. Two word searches related to pi are also included. 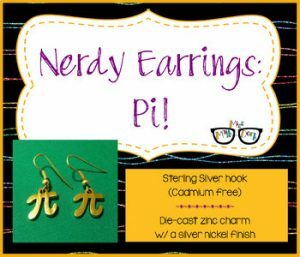 Discovering Pi Activity: This activity comes from my friend Lindsay Perro. 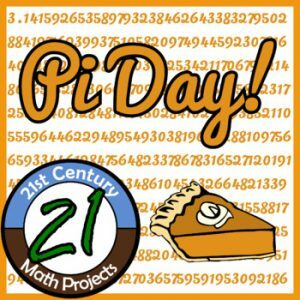 This activity includes some fun pi facts and a look at the first few hundred digits of pi! Teachers will need to provide six cylindrical objects (soda cans, jars, etc) for students to measure. They will discover the diameter, radius, area of the base, circumference of the base, and volume of the object. If the objects are unavailable, a supplemental sheet has been provided for students to measure the bases of a few different objects.